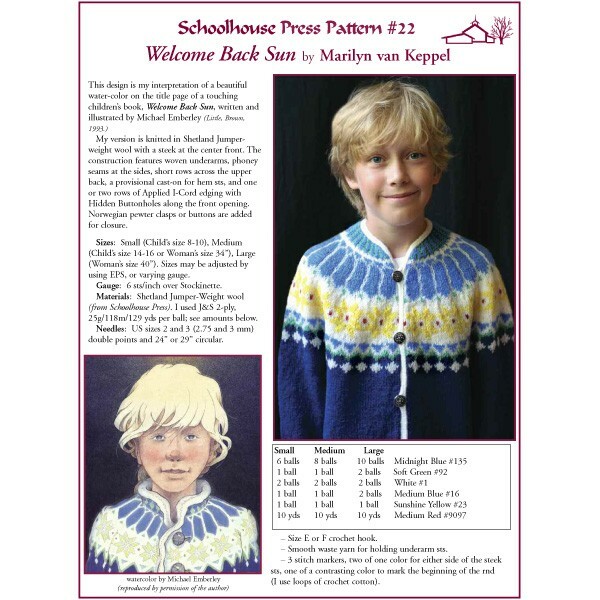 Marilyn's sweater was inspired by a painting in the frontispiece of the touching children’s book, Welcome Back Sun, by Michael Emberley (Little, Brown,1993), sadly now out of print. A yoke-style cardigan knitted in our Shetland Spindrift wool, it's Scandinavian designs are fetching for children and adults. Includes HIdden I-cord buttonholes, EZ's Phoney Seams, and a hem. Multiple sizes.